Jeff Sessions has been forced out as attorney general. "At your request, I am submitting my resignation," Sessions wrote to the president Wednesday. President Trump tweeted the news, writing, "We thank Attorney General Jeff Sessions for his service, and wish him well!" A senior Justice Department official said White House chief of staff John Kelly called Sessions to request his resignation. The president did not call him. A senior White House official told CBS News that the president had been "itching to pull this trigger" since before the midterm elections, but held off on the urging of Senate GOP leadership and senior White House advisers. Sessions has repeatedly come under attack by Mr. Trump for recusing himself from the investigation into Russian interference in the 2016 election. Matthew G. Whitaker, Sessions' chief of staff, will now become acting attorney general, and he will also oversee the Russia investigation that the president often refers to as a "witch hunt." Before Whitaker joined to the Justice Department, he wrote an opinion piece for CNN in August 2017 criticizing the investigation by special counsel Robert Mueller. Whitaker argued that Mueller should not be able to investigate the Trump family's finances in the course of his probe. "It does not take a lawyer or even a former federal prosecutor like myself to conclude that investigating Donald Trump's finances or his family's finances falls completely outside of the realm of his 2016 campaign and allegations that the campaign coordinated with the Russian government or anyone else. That goes beyond the scope of the appointment of the special counsel," Whitaker wrote. "Any investigation into President Trump's finances or the finances of his family would require Mueller to return to Rod Rosenstein for additional authority under Mueller's appointment as special counsel," Whitaker also wrote in the CNN piece in 2017. Whitaker issued a statement Wednesday night calling it a "true honor" to be chosen by Mr. Trump. "I am committed to leading a fair Department with the highest ethical standards, that upholds the rule of law, and seeks justice for all Americans," Whitaker said. "I will work with our colleagues in Federal, State, local, and tribal leadership, including our partners in law enforcement and our U.S. Attorneys, to ensure the safety of all Americans and the security of the nation." Earlier Wednesday at the president's news conference, CBS News' Major Garrett had asked about potential changes in his Cabinet, in particular, whether Sessions and Deputy Attorney General Rod Rosenstein would remain with the administration. The president didn't offer a direct answer, saying only, "We're looking at different people for different positions." He added that he is mostly "extremely happy" with his Cabinet. 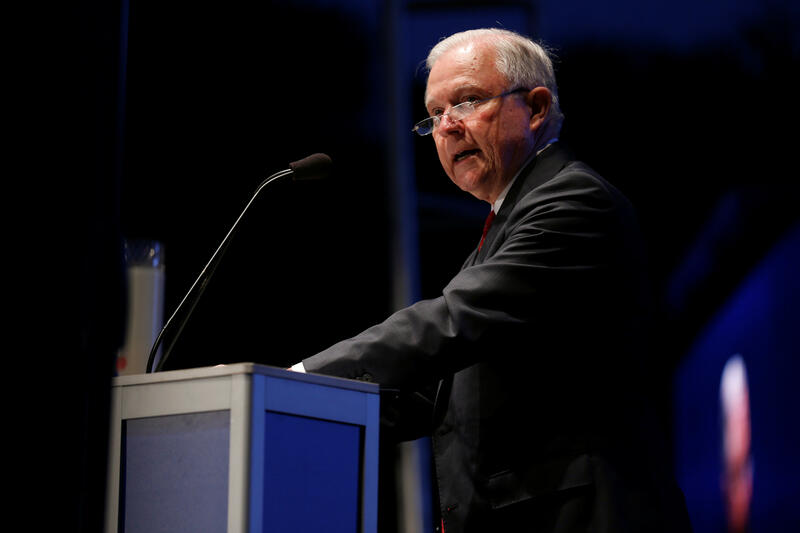 In his resignation letter, Sessions touted the department's initiatives, saying that the Justice Department had taken on "transnational gangs that are bringing violence and death across our borders and protected national security" and noted efforts on immigration enforcement and the opioid epidemic.